As we saw in the last section, slideshows are normally placed inside of special boxes which Joomla calls modules. In the last section, we added the Unite Nivo Slider to create a slideshow in a module on our home page. But there may be times you want to add a slideshow to one of your articles. In general, articles go in the main content area of your template and modules go into module positions that are outside of the main content area of your template. Thankfully, there is a free Joomla extension called Modules Anywhere that we can use to place a slideshow inside of a module and then place that module inside of any article. The steps are pretty simple. First, we create a new slideshow module by copying our original slideshow module. If we want to use different images, we create a new slideshow category and then assign a new folder of slides to this new category. Then place the new category ID number in the new slideshow module. In this article we will go over these steps. We will assume that you have already downloaded the Unite Nivo Slideshow and followed the steps in the last section to create a slideshow. 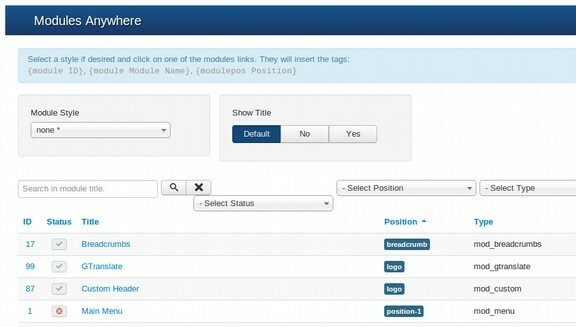 Modules are boxes used by Joomla to display functions such as slideshows and forms. This extension allows you to place any module inside of any article simply by clicking on a button – just like you were inserting an image into an article. Click on Download to download the free version of this extension to your computer. Then go to your extension manager and upload it to your website. After uploading Modules Anywhere, there will be two Module Anywhere plugins installed, one that allows displaying the modules in the system, and another plugin that places a button on the bottom of the editing window that will insert the module into an article. Both plugins will be automatically enabled, so you don't have to enable either of them. Next, create a copy of your slideshow module. Go to the Module Manager, select the slideshow and click Duplicate. Then publish the new module. For simplicity, we will use the same slides and slide category we used for the front page slideshow. Go to the front end of your website right now and you will see two copies of your front page slideshow. The new slideshow must be published for it to be visible in an article. But it does not need to be published in a position on your current active template. Open the duplicate slideshow and put it in a position on a template that you are not using. We will put it in the Top position of the BEEZ3 template. Next either create a new article or open an existing article to place the slideshow in by going to the Article Manager. We will place this slideshow at the end of the last article we created which was article 6.1 Create a Front Page Slideshow. After you open this article, scroll to the bottom and you will see a new button called Insert Module. Set Show Title to No. Then scroll down to the new Article Slideshow and click on it. You will then see the code inserting the module in the editing window. You won't see the actual module. Then click on SAVE and Close. If you made a new article for your slideshow, the final step is to add a new menu item so we can view the new page to make sure the slide show appears the way we want. As we inserted the slideshow into an article with a menu item, simply click on the menu item to view the slideshow in the article. Now that you know how to insert a module into an article, in the next article we will discuss how to embed a You Tube Video in a Joomla article. Here is a video about Joomla. Here is the link to the video. Note that we can display this link without actually displaying the video. In the next article, we will describe the tool we used to insert this video in this article.